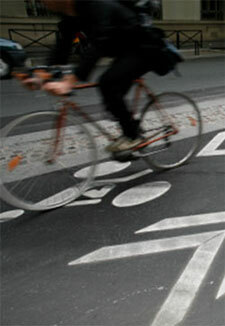 Have you been injured in a bicycle accident in the Danville, Pleasanton, or Livermore area? I can help. If you’re trying to get compensated for your injuries, you’re up against a big insurance company that is only after their own interests. I level the playing field. Each year, thousands of people are seriously injured or killed in cycling accidents due to the negligence of motorists, bicycle repair shops, and bicycle manufacturers. Despite the widespread information available to the public regarding the rights of cyclists on public roadways, many motorists are oblivious, or even resentful of cyclists with whom they are required by law to share the roadways, and negligently cause serious injuries or death to cyclists. Tom Sokat, an avid mountain and road biker for many years, will fight for the rights of cyclists. If you or a loved one has been injured in a cycling accident, please call Tom immediately for a free consultation. No one is better qualified than he is to represent you and get you what you deserve. The following list provides guidelines to follow so you don’t hurt your chances of a fair settlement in your bicycle accident case. For more information on why you should beware of insurance companies, please read this. If you’re in Contra Costa or Alameda Counties and think you have a personal injury case, call me. There is nothing to lose when calling our office to inquire about your bicycle injury case, but there might be a lot to lose if you don’t. So call me now. I will listen and take the time to carefully evaluate your case. If I can’t take your case, I’ll tell you why and give you advice on what to do next. Let’s get started! Tom serves the entire San Francisco East Bay and San Luis Obispo area including the towns of Danville, Pleasanton, San Ramon, Walnut Creek, Dublin, Livermore, Alamo, Sunol, Paso Robles, Atascadero, Pismo Beach, Cambria, San Simeon and all points in between. See all of Tom's interviews here. Even if you think you don't have a case, contact me. You may be surprised. In any case, I'll advise you for free on what your options are. Having a hard time finding an attorney to take your case? Don't get discouraged. Find out why and what you can do to get an attorney to say yes. Tom made me feel completely at ease that he would take care of everything. I was hit by a car while cycling and had a bad concussion with broken bones. Needless to say, it was so nice to have Tom there to take over and give me piece of mind. He was honest and followed thru with what he said. Highly recommend him. I’m so grateful I found Mr. Sokat after I was in an accident. The insurance company was toying with me and I felt I was getting the short end of the stick. I’m so happy I found Tom and hired him though. When you need expert advice and someone to guide you thru the process, the peace of mind you receive is priceless. Had I not had Tom’s help it would have been disastrous for me. I hope I never need to hire him in the future, but if I do, he’ll be my first phone call. Thanks Tom! Thomas Sokat is a loyal caring human being he’s good at his job.He came to my house and talked with me about my case. I was hit by a car riding my bike. I’m on disability and low income. He took care of everything. All I had to do was sit back and wait for my money.He was very helpful. He insured me he would take care of everything. That’s what he did. He’s a man of his word.I highly recommend Law office of Thomas Sokat. The call is free and there is never a charge until we win. Serving the entire San Francisco East Bay including the towns of Danville, Pleasanton, San Ramon, Walnut Creek, Dublin, Livermore, Alamo, Sunol. © 2016. Tom Sokat Law. All rights reserved.